Another day another ice cream ;). Squeezing in a couple more ice cream posts before National Ice Cream month is over and I wanted to include this ice cream sandwich from The Baked Bear in San Francisco. Photos of The Baked Bear’s goodies were floating around instagram nonstop before my trip out there so I had this marked as a must try for my last trip. 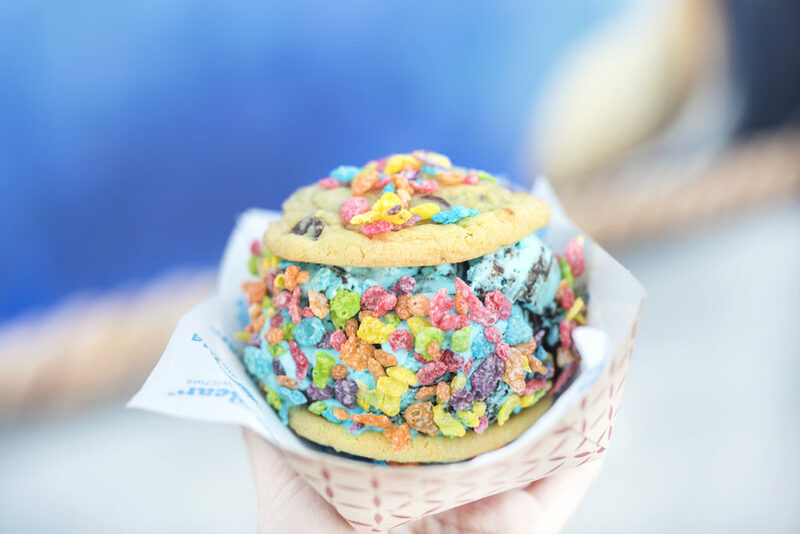 You can get just a classic scoop of their ice cream in a cone or cup with some tasty toppings OR you can create a custom ice cream sandwich. I tried the latter. They have 10 different cookie options to choose from for the top and bottom of your sandwich. Plus they also offer brownie and doughnut sandwiches. They have a signature flavor called “Bear Batter” which is the one I tried. I figured, I might as well try the signature since I have no idea on when I’ll be back. It’s not my favorite, I’ll leave it at that. It was really sweet. I guess it didn’t help that I then added on fruity pebbles which probably upped the sugar, a lot. I have to say, I am 100% guilty of “eating with my eyes” here. There’s been a huge trend of what people have deemed as instagram food going around. You know, super bright, colorful, over the top, indulgent treats that are eye catching for the ‘gram. I think this is definitely one of them. As large as my sweet tooth is, I still try to keep balance with what I eat. This was just too much sugar for me. To be fair, the others that I were with had tried the salted caramel fudge ice cream and the cookies & cream ice cream. Those were GOOD. Really good. The ice cream was very creamy and not too sweet. All in all, I would definitely say it’s worth stopping by. I really liked how you can customize the sandwich with different cookies. With that said, I think my visit here helped me realize that sometimes simple is better. Have you tried an instagram food trend lately that just did not stack up to your expectations?